On Saturday afternoon Lyn Brown MP had organised a West Ham CLP Labour Super Saturday doorstep in Canning Town North ward. We split into difference canvass teams and I went with Party stalwart John Saunders and Stratford Councillor, "Red" Terry Paul who was born in the ward and still lives here today. We started in Addington Road, E16 which Terry told us was the childhood home of actor Reg Varney. Who I remember from the 1960's comedy classic "On the Buses" (see above). 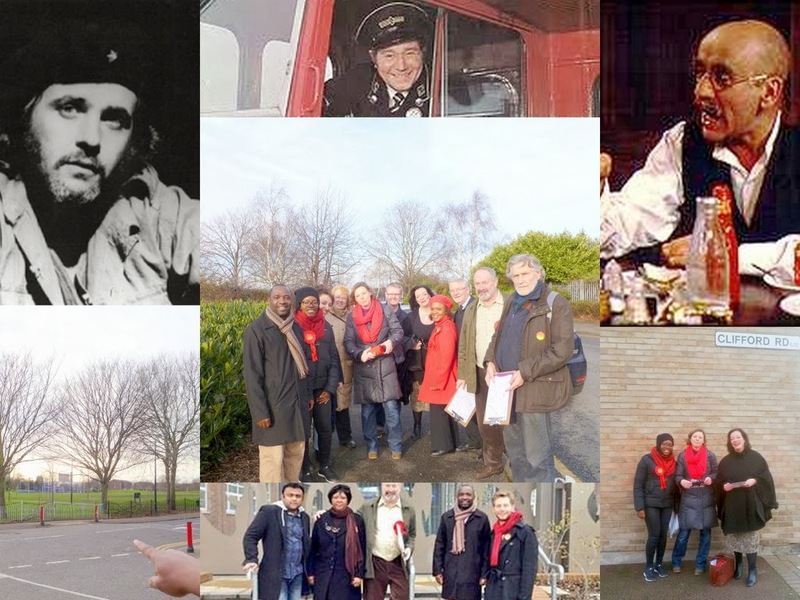 While one of our local Labour Party volunteers actually lives in the flat that actor and singer David Essex use to live in as a boy (see his picture as "Che" in the musical "Evita"). Both Reg and David went to the local Star Lane Primary School (at different times). Terry also pointed across the local park (see picture bottom left) where the house he was born use to be and also the home of Jonny Speight, who became the writer of iconic BBC hit "Until Death Do Us Part" and created the West Ham supporting East End monster bigot, Alf Garnett (see above played ironically by north London, left wing, Spurs supporting, Jewish actor, Warren Mitchel). The actual canvass was pretty solid and supportive Labour heartland. We had some decent conversations with local residents on local issues and problems but on the whole it was very positive. One of the last addresses we called at the resident was openly anti-Labour and said that all Labour Councillors in Newham were former patients of closed mental health institutions! He said that if he had a gun he would shoot the lot of us. I told him not to be so silly. While he is fully entitled to his views about our mental health, he should realise that for all our faults, Labour is the only Party who stands up for working people against the rich. If the Tories get in next time with a majority, then forget about a free NHS, employment protection and a fair wages. You know in your heart of hearts, that they will be coming to get you! "Labour is the only Party who stands up for working people against the rich." Under Labour income inequality grew. You created a housing crisis. Now Labour has the cheek to say there is a cost of living crisis. Relative inequality did increase and Labour should have done more about this but Child poverty dropped like a stone. We did not create the housing crisis - all governments since 1979 have done that. Liberal economics is to blame. I don't think anyone can deny that there is a cost of living crisis since nearly everyone is far worse off now than they were in 2010. If fact wages and a share of national income have been going down and down for the low to middle. Labour can fix it by introducing fairer progressive taxes and a living wage for all.